A squeaking pair of dress shoes can be both annoying and embarrassing. There is nothing quite as disappointing as having your favorite pair of expensive dress shoes develop a sharp, loud squeak, emitting from each step that you take. Squeaking shoes can be caused by a number of problems. From a troublesome insole to a damaged heel, there are many factors which can cause dress shoes to squeak. In this article, we’ll be showing you how to stop shoes from squeaking by identifying causes and presenting solutions for many common problems. Squeaking can at times be caused by friction formed between the soles of your shoes and your insoles. If the liner is removable, remove it and sprinkle some baby powder, cornstarch or talcum powder into the bottom of your shoe. This will absorb the moisture which prevents less motion between the liner and sole, thus stopping squeaking in its tracks. A powder can be just as useful for shoes which squeak on tiled or wooden surfaces. It can make your shoes slippery if the traction is not good, so take care when applying a bit of powder to the bottom of your shoes to prevent squeaking. Another simple solution for squeaking caused by insole friction is simply placing a paper towel or a dryer sheet into your shoes. Fold over a sheet or paper towel and place it between the insole and the sole of your shoe. Dress shoe squeaking is often caused by the tongue rubbing against the inside of the shoe itself. Get yourself some fine-grained sandpaper or a nail file and sand the tongue down until it no longer rubs against your shoe. You can alternatively apply athletic tape instead. Wrap the edges of the tongue of your shoe with athletic tape, effectively getting rid of the squeaking that arises when the tongue rubs against the inner. Leather and synthetic leather shoes will begin to squeak if the natural oils present in the material has dried up. Unconditioned leather develops this problem frequently. Use as little oil as possible, opting for olive oil if possible but vegetable oil will work. You need to take extreme care to not stain your shoes. Apply the oil with a dry cloth or paper towel and wipe off any excess. It is highly recommended that you put your shoes on a shoe tree after oiling so that they will assume their original form once dried. Always leave your shoes overnight after oiling before wearing them again. The most common place where a squeak starts is at the seams of a shoe. This is, therefore, the best place to begin applying oil. If you are in the habit of wearing your shoes without socks, then it is likely that any squeaking arises from excess moisture build-up. Remove the inserts or insoles and leave your shoes to dry for at least 24 hours. Refrain from using a heater or dryer on leather as the leather will crack if the temperature is too high. Rather, leave them in a warm room which is free from humidity. Another tip is to shove your shoes full of crumpled up newspaper and then leave them to dry. The newspaper will absorb any excess moisture. Replace the newspaper every few hours depending on how much moisture is present and use a shoe horn or shoe tree to help them resume their original form and contours. At times the underside of your shoes will harden due to extended use. This can cause squeaking. If your shoes have been in use for a considerable duration, take some fine sandpaper and sand down the soles of your shoes slightly. Remove any hardened rubber or plastic without sanding too much that the shape itself is affected. Leather shoes, in particular, are known to develop squeaking when their shoelaces begin to rub against the tongue. Apply leather conditioner to the tongue and shoelace grommets, or try some saddle soap. This will reduce the friction, make the leather supple, and get rid of the squeak caused by noisy laces. Many shoes begin to squeak loudly on linoleum-style flooring and carpeted areas. If your squeak is coming from the bottom of the shoe and sanding down the hardened tread does not help, then you can give a rubber sole spray a try. Not only will applying rubber spray to the bottom of your shoe stop your squeaking, but it will also improve traction. Before rushing off to buy a can of rubber sole spray, first, apply some duct tape to the underside of your shoe and see if it stops the sound. If it does, then a can of spray will definitely stop the squeak. Any damage to your shoe can result in squeaking. Dress shoes with loose heels or soles will release an annoying squeak which worsens over time. Shoe glue or any good, strong adhesive, will work wonders to secure your sole should it be loose, while other issues should be addressed by a cobbler. 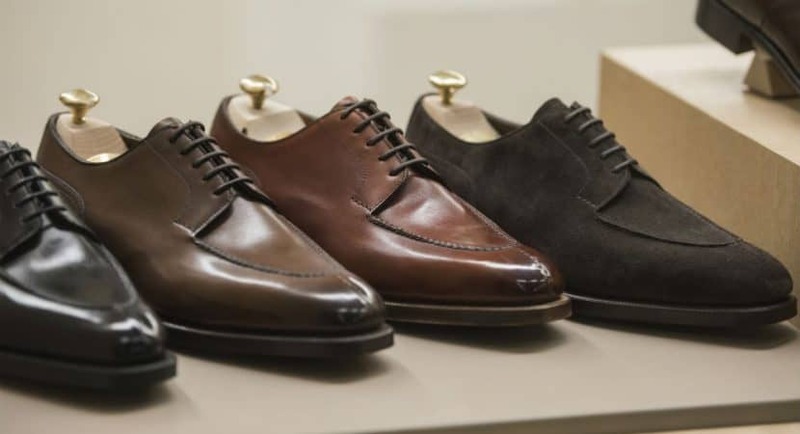 If a brand-new pair of dress shoes begins to squeak shortly after purchasing then it is best to consult the shoe manufacturers customer support for a return. Dress shoes should not squeak straight out the box. Squeaking is an issue which develops from wear-and-tear and a lack of maintenance. Most manufacturers will be more than happy to replace your pair of shoes with a new set that does not squeak. Be sure to contact your seller prior to attempting to fix the problem yourself, as this could void your warranty. At times, cheaply manufactured dress shoes will have a thin layer of black paint present on their soles. This is supposed to help with traction but instead often causes squeaking. The only answer is to wear the shoes until the paint is worn down or to remove the paint using a piece of light sandpaper. The soles of your shoes may at times also become dried out, resulting in a squeak when walking on highly polished flooring. In this case, an oil-based lubricant such as WD40 applied to the rubber sole of your shoe will resolve the annoyance for good. All it takes is a few applications. Just make sure that you don’t wear your shoes immediately afterwards. Give them some time to dry.